This article is based on my introduction to the presentation by Professor Alex Collie at the Pre-Symposium Seminar held in Hobart on 15 June 2017. I have previously tried to explain the reasons for my interest in reform of compensation systems. I made an amateurish video to explain, but my wife was aghast that I was wearing what appeared to be a flannelette shirt in the video. That probably represents the Sharman background as farmers on Tasmania’s NW Coast! As I tried to explain in the video, what I see in my current practice, on an almost daily basis, are workers whose recovery is unnecessarily impeded by ‘the system’. 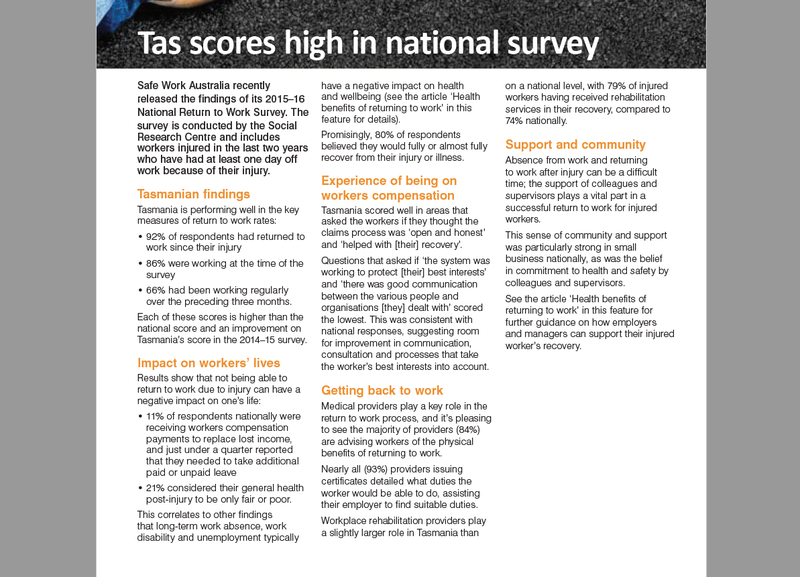 While some have argued that Tasmania performs better than inter-state jurisdictions, I don’t think it matters too much about how we compare, rather any worker’s recovery unnecessarily affected by the system is a waste. That’s my concern. I started my medical career in Tasmania in 1981, working at Tullah on Tasmania’s West Coast as the doctor for the Construction Workforce for the Pieman River Hydro-Electric Scheme. I vividly recall 3 fatalities during that period – a construction worker on a power station roof feel to his death, a loader operator in a sand quarry was buried alive when the wall of the quarry collapsed and a diver who died trying to retrieve valuable stainless metal gates used to close off the diversion tunnel from very deep within the cold and dark waters of the Murchison Dam. During my later period of employment with the Hydro, I recall an incident causing multiple confined space deaths at the Tungatinah Power Station in the Central Highlands. There were serious accidents that didn’t result in death and even some positive stories. I remember a seriously injured construction worker who went on the a prominent career in Human Resources in the Mining Industry as a result of his incapacity for ongoing physical employment. What I have seen over the years is a reduction in these types of incidents with improvement in workplace safety generally, as reflected by falling incidence of workplace injury and associated compensation claims. I have however witnessed an increasing problem with chronic pain and secondary psychological consequences resulting in long-term disability following work injuries. Most of these cases end up receiving income support from Centrelink. The overall trend in claims management has been a tougher approach. I recall the days when the Tasmanian Government Insurnace Office (TGIO) operated in Tasmania and acted as the insurer for the Hydro Workforce. There was sense from the claims personnel of doing what was right for the greater good, not just the financial benefit of the insurer they worked for. That ethos has all but disappeared. In the late 1980’s there was enthusiasm for the new concept of ‘workplace rehabilitation’ and I have a certain nostalgia for a generally positive and co-operative approach to help injured workers back to work at that time. In recent years, I have become ‘politically’ involved because of my observations about escalating adversarialism and worsening claims outcomes from a medical and rehabilitation perspective. My observation might reflect the change in the work I undertake. I have changed from a role as company doctor involved in strategies for both prevention and rehabilitation through to my current role where I see the worst end of the compensation system – the litigated, controversial and long-term cases of incapacity. An alternative explanation is that the apparent deterioration in our systems is due to increasing numbers of people with age-related and degenerative disorders being managed through our compensation systems where they don’t really belong. Or perhaps the change results from increased focus on financial outcomes and scheme viability. I can’t answer that, only guess. The evidence might provide some clues. When I started talking to other practitioners about these issues, I became aware there were similar concerns amongst a variety of medical, allied health and rehabilitation practitioners, both in general medical and rehabilitation practice and the specialities that become involved in long-term compensation cases – pain physicians, clinical psychologists, rehabilitation physicians, orthopaedic & spinal surgeons, and psychiatrists. Many doctors tell me they only get involved in workers compensation reluctantly and in some fields it is difficult to get a doctor prepared do see a workers compensation case at all. The other significant development in recent years has been the apparent exponential growth in research in the field of Compensation Health. “However, research into causes of poor health outcomes for these people is fragmentary and inconclusive. Not enough is known of the effects of different types of compensation schemes or different methods of management of cases (by all practitioners involved) to allow the development of a ‘best practice’ model. Since that time there have been organisations set up dedicated to research in this field e.g. ISCRR (Victorian-based) and the Recover Injury Research Centre (Qld Based). When I was involved in putting forward ideas about how to improve the system, there was fierce resistance, initially from the insurers. I encountered this personally when I made a presentation a few years ago to the Private Insurers Group on behalf of the AMA. Luckily that initially hostile reception has led to processes being put in place that have allowed constructive ongoing communication to occur between doctors and insurers. There does seem to be agreement though that, if there was a problem, it is only 5-10% of cases managed through the workers compensation system. The majority of straightforward cases do well. Like in most systems though, it is the complex 5-10% of cases that incur the majority of the costs, both financial and health-wise. For a meaningful debate about the performance of our workers compensation system we need facts and evidence, not just speculation and opinion. How do you measure the performance of compensation systems? Can you compare different jurisdictions in relation to performance? My personal interpretation of the evidence I had seen was that there is a need for major reform of how Governments should manage “work disability”, including workers compensation. There is enormous waste and “collateral damage” to workers health from liability assessment processes. Resources expended on determining which system injuries affecting work capacity belong within, is a waste within our financially strapped health care system. Tasmania at present is unfortunately at the forefront with extreme pressure on its Public Hospital System. My presentation at the main TAVRP Symposium “The Dark Side of Rehab” on 16 June 2017, focused on that waste. The challenge in shifting the workers compensation concepts is not more talking, nor is it more research, nor is it gnashing of teeth or angst and frustration. To shift workers compensation requires people to actually stop talking and stop thinking that “policy” and “this is how we do things”. My work doesn’t require any change of legislation, doesn’t require endless meetings, doesn’t require endless piles of paperwork- it just does what others talk about. It is the “doing” that is changing workers compensation, and it is the “doing” that will stop the endless waste not just of money but of workers. Peter, do we know whether outcomes (however measured) have improved, worsened, or remained the same since the systems were medicalised? I like your above article and generally believe it to be reasonably balanced as it includes much of the discussion we have had and collaborated about over the past few years. Also very much enjoyed listening to Professor Collie on the research he has undertaken relating to the various compensation systems and the adverse affect on some cases “the system(s)” can have. The Self Insurers in Tasmania were very pleased to sponsor this event as you know. As you also know, representatives from WorkCover Board in Tasmania also attended Professor Collie’s presentation and whether there is any positive outcomes in their area as a result, only time will tell. “When I was involved in putting forward ideas about how to improve the system, there was fierce resistance, initially from the insurers. I encountered this personally when I made a presentation a few years ago to the Private Insurers Group on behalf of the AMA”. I think initially this creates inferences that the Insurers were being unreasonably negative towards you and your motives a few years ago. What is not mentioned here is that when you were putting forward your ideas in the initial AMA paper you presented to Insurers and Self Insurers, the preamble included some absolutely outrageous claims about Insurer and Self Insurer behaviour which were completely untrue. These claims of behaviour were the sole cause of the “ills” of the system according to your paper with no mention of the roles of any other “players” or stakeholders within the system. I recall asking you very specifically whether you were genuinely serious about making one claim in particular. My suggestion would be to (as objectively as you can) re-read this paper and ask yourself, was it really unreasonable that there was the claimed “fierce” resistance in the first instance. I further recall speaking to other stakeholders at the time and there was general agreement that many if not most of the preamble claims in that paper were “arrant nonsense”. As you have said however, there has been some positive dialogue since that time. There can be no balance to the conversation and no real progress made until there are injured workers also sitting at the table. I don’t mean the industry surveys where the questions require a 1-10 pre-scripted answer ticked. I mean injured workers sitting and being listened to and real questions asked and real answers given. A few years back in South Australia over a 3 day period I ran a phone in for injured workers and their families- there were no scripted questions it was just for injured workers to speak to a group of injured workers so that we could take their views back to the Injured Worker Focus Group. Before all of the responses were written up verbatim the then CEO of WorkCover SA asked me to give him a verbal report, not only did that verbal report and the subsequent written report get listened to but it was acted on. To the very best of my knowledge this was the only time anywhere in Australia such a phone in has happened and the only time that the CEO wanted to know before the official report was written. What surprised the CEO was that employers also rang with complaints about the way they were being treated-that was something he never expected to hear. Times have changed since then, but things have not improved for injured workers, we still have injured workers considering-attempting-completing suicide; we still have injured workers facing personal and family bankruptcy, we still have injured worker family breakdown, we still have injured workers living on or below the poverty line and we still have no injured workers sitting at the table. Workers compensation is a triangle- without the injured workers being included then the system will continue to fail everyone far too often and that is no longer tolerable. PS Even now when the then CEO and I talk, he still marvels at what that short phone survey told him and how surprised he is that more such surveys are not done. I was pleased to have self-insurer sponsorship of the session by Alex Collie. There is a lot we can all learn about running an equitable compensation scheme from self-insurers. Generally self-insurers are much more cognisant of the risks of ‘collateral’ damage from claims management processes to their employees and tend to manage claims in a more ‘user-friendly’ manner and, from what I see, achieve better health and rehabilitation outcomes as a result. It is probably not productive, in this forum, to revisit the debate about the previously-expressed concerns of doctors about matters relating to private insurers, especially when the readers of this blog haven’t seen the documents you refer to be able to make their own judgement. I think the debate has moved forward since that time. Suffice it to say, the AMA in Tasmania has not been the only organisation to raise issues relating to the negative effects of claims management practices. Private insurance management practice problems have been brought to light in various inter-state jurisdictions i.e. The CommInsure ‘scandal’; The Vic Ombudsman’s Report and the NSW Parliamentary enquiry into workers compensation. Some of the concerns about interstate jurisdictions have been quite troubling particularly the evidence of a toxic anti-worker culture in some insurers expressed through Social Media Groups, although I haven’t seen evidence of that in Tasmania. I believe the focus locally has moved onto discussion about the extent of issues in our local system with multiple stakeholders, the impact this can have on outcomes and what action WorkCover proposes in response, particularly with the new evidence presented at the TAVRP Symposium reflecting local research findings. There are some positives in that a ‘Medical Advisory Panel’ has been appointed by WorkCover, but I am yet to see the input I believe is required from injured workers themselves for a truly balanced system. As you say, there were WorkCover Board members who heard the presentation from Prof Collie, so we will see……. —but you do continue to refer back to that time ( as you have done here in your initial article -making it sound like you have were the victim in that set of circumstances with the Private Insurers) which as you say is not really all that productive. Mayhaps it is time to draw a line in the sand and start a fresh conversation with all the relevant parties at the table. I have already told Peter that I am willing to help as much as I can to gain the trust of injured workers and bring them to the table. For now though there has to be an acknowledgement of past issues that need to be finalized and let go and there has to be a way to set up a reference body to ensure that all parties are represented and move towards a better workers compensation process. ‘Relevant parties at the table’ – hopefully that includes you Rosemary or once again, the system will be talking to itself.